The formal aspects of non-concatenative morphology have received considerable attention in recent years, but the diachronic dimensions of such systems have been little explored. 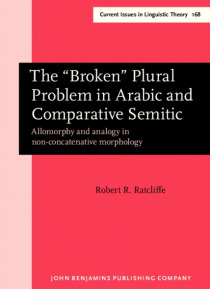 The current work applies a modern methodological and theoretical framework to a classic problem in Arabic and Semitic historical linguistics: the highly allomorphic system of stem-internal or broken plurals. It shows t… hat widely-accepted views regarding the historical development of this system are untenable and offers a new hypothesis.The first chapter lays out a methodology for comparative-historical research in morphology. The next two chapters present an analysis of Arabic morphology based on contemporary formal linguistic approaches, and applies this analysis to the noun plural system. Chapter Four shows that neither semantic shift nor ablaut-type sound change account adequately for the data. The fifth chapter offers a systematic comparison of the plural systems of Semitic languages, incorporating much new research on the languages of South Arabia and Ethiopia. Chapter Six proposes a new reconstruction.